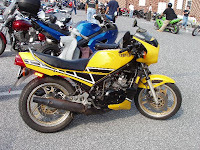 On 11/4/07 I took a ride up to the last Ephrata First Sunday Rally of the year (sniff). It was a chilly 41F when I left Delaware. In a few weeks 41 will feel almost warm, but considering the unseasonably warm temps we've had this Fall 41 felt downright cold. It was the first time since March I had my "serious Winter" gear on, and I realized how each year my fingers seem to protest the cold a bit more. I'd estimate the crowd at Ephrata was only about 50% of maximum. I guess a lot of riders with more sense than I have put their bikes to bed until Spring. Fortunately, there were still plenty of cool and unusual bikes...and a couple of fellow Retreads to shoot the breeze with. 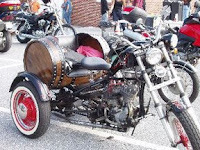 Here are pics I snapped of an old toaster tank BMW, a cool 2-stroke RZ350, and a homemade trike (Harley-Keggerson? ).